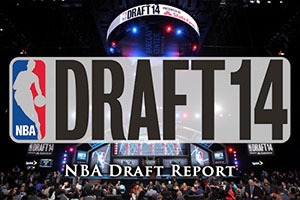 When it comes to keeping up to date with all of the fun and excitement from the 2014 NBA Draft, there is a lot to keep tabs on. There have been a number of trades taking place and while these still need the approval of the NBA before they are fully ratified, these are the deals that are in place. The Hornets come out of this trade with the rights to P.J. Hairston and a future second round pick. The Heat acquired the rights to Shabazz Napier, the 24th pick that some believe was the point guard that LeBron James was rooting for. If this is indeed the case, the Heat may have pulled off a power play that increases the likelihood of James sticking around to play his basketball in Miami in the 2014/15 season. If you intend to bet on where James will be playing, this may be of interest to you, and you may want to get in before the odds change. The Orlando Magic have picked up the rights to point guard Elfrid Payton, who was the 10th pick. The 76ers have picked up a 2nd round pick in 2015, a first round pick in the future and they have also acquired the rights to Dario Saric, the 12th pick in the 2014 NBA Draft. Saric is planning on staying in Europe for another two years so he won’t be heading to the Sixers any time soon but the Sixers look to be taking a view to the future. When you think that the 76ers have also picked up the currently injured Joel Embiid, they aren’t too fussed about having players ready to start the new campaign. The Chicago Bulls have picked up Doug McDermott, the 11th pick and have also snapped up Anthony Randolph. Meanwhile, the Nuggets secured Jusuf Nurkic, the 16th pick, Gary Harris, the 19th pick and they will be picking up a second round pick for 2015 as well. The Nuggets have also snapped up Arraon Affalo while the Orlando Magic will be picking up Evan Fournier, the 56th pick for 2014. The Pelicans have managed to pick up Omer Asik and a sum of $1.5m which has allowed the Rockets to pick up a protected first round pick for 2015. With the Rockets looking to be involved in the running for Carmelo Anthony or LeBron James, this move has helped to clear a space on their roster. With the free agents not allowed to sign for a new team until the 10th of July, there is still a bit of time until the rosters will settle down and finalise. However, NBA fans all around the world are currently building up their expectations and raising their hopes for the forthcoming season.